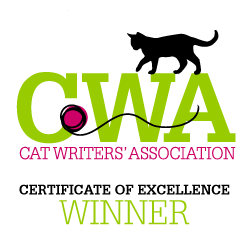 We're so excited to share our news about receiving five (5) Certificates of Excellence from the Cat Writers' Association. The Cat Writers' Association (CWA) held its first Communications Contest in November 1994. Karen Kuykendall, founding member of CWA, designed the Muse Medallion™ which recognizes excellence among writers, photographers, artists, and broadcasters. Each year, members of CWA submit samples of their work for consideration of the coveted Muse Medallions. Qualified entries are evaluated by professional CWA members who volunteer their time and expertise to serve as contest judges. Entries are evaluated against an objective standard of excellence. Certificates of Excellence are awarded to entries that earn an average score of 90 or higher. 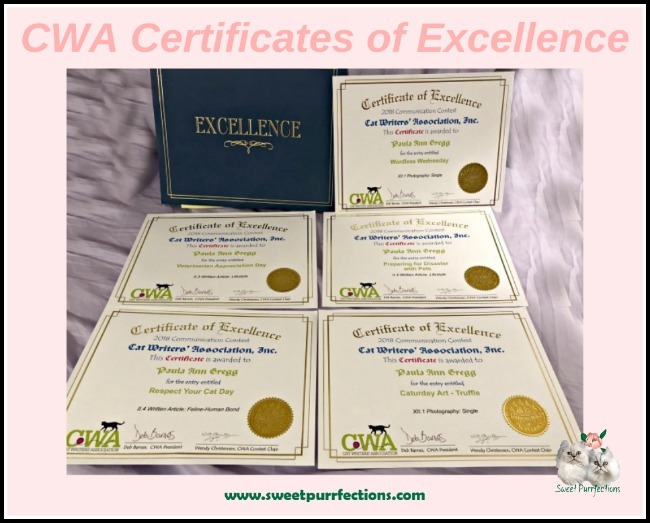 These certificate of excellence winners are then evaluated to determine who should receive the Muse Medallion in each category at the annual CWA conference. 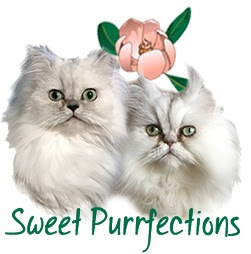 We worked hard the past two years to redesign and rebrand the Sweet Purrfections blog to share stories, photos, reviews, and evergreen content about Living and Learning with Persian Cats. We did submit several entries and were thrilled to learn that five entries were selected to receive a Certificate of Excellence. 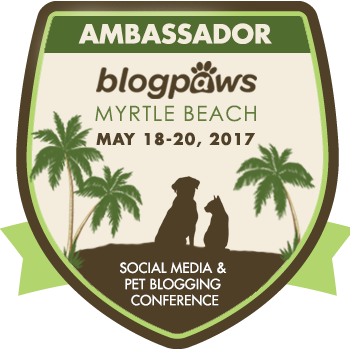 We thought we'd share the blog post that received this honor for our readers. We entered a couple of photographs for consideration this year. 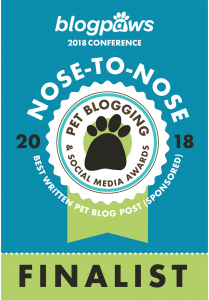 Through the assistance of fellow CWA members, BlogPaws members, and blogging friends, Mom Paula has worked on taking photos of the girls in natural light and not worrying about having the entire body in the photo. 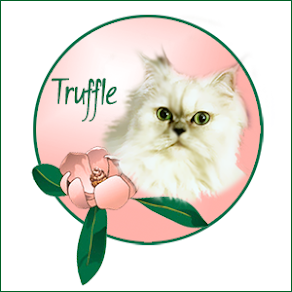 This photo of Truffle showed her silvery fur against her long white whiskers and green eyes. You can find this post on our Caturday Art post in November 2018. We were honored that a second photo also received a Certificate of Excellence for the Photography - Single category. It's always difficult to get a good photo of the girls when they are next to the window because of the light coming through the window. The afternoon sun was just right to capture this photo of Truffle. 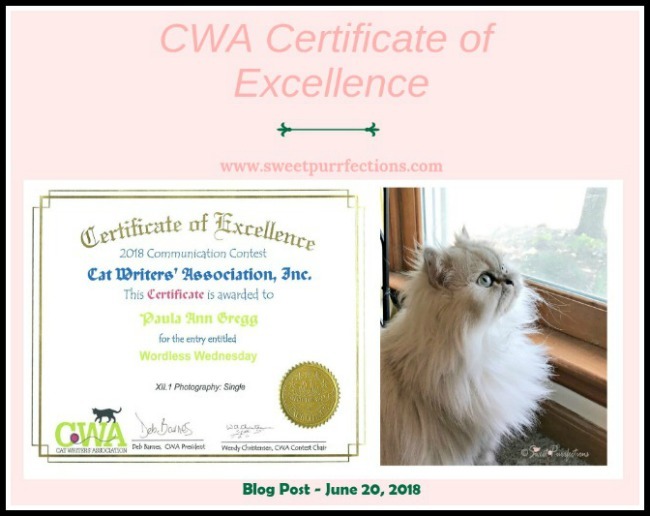 You can see the original post on our Wordless Wednesday post from June 2018. 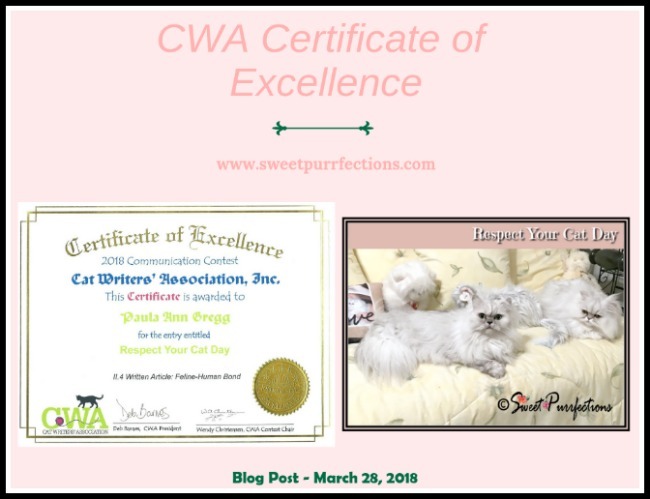 Our blog post that was written about respecting your cat talked about reasons to respect your cats and how you can show your cat that you respect them. You can read more about this topic on Respect Your Cat Day from March 2018. 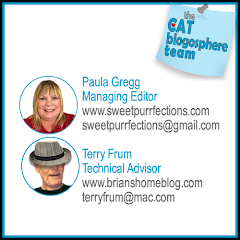 One of the changes with the blog this year was writing more evergreen content where our readers, old and new, can get information about a life with cats. 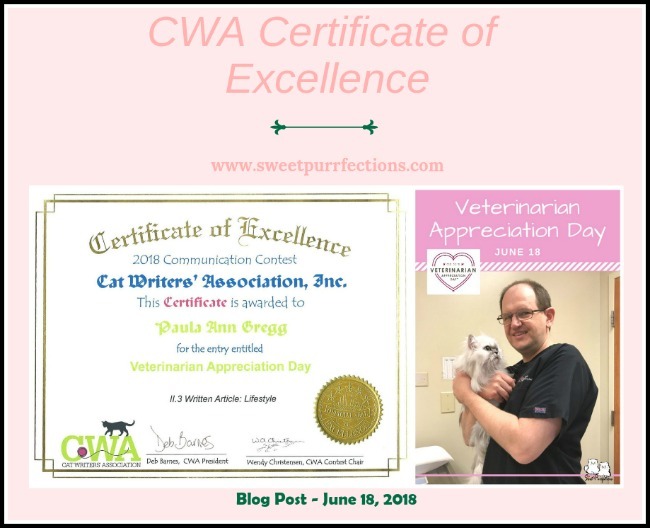 We received the first Certificate of Excellence in the Written Article - Lifestyle category for a post we did about veterinarians. This was an article that discussed the rewards and challenges of veterinarians. You can read more at Veterinarian Appreciation Day from June 2018. 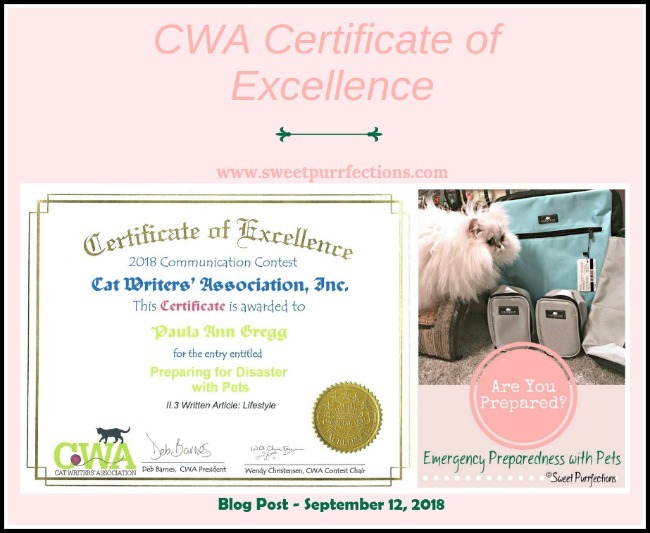 We wrote the second post (that received a Certificate of Excellence) while we were under a hurricane warning in South Carolina. We shared the importance of being prepared for emergencies and natural disasters for both humans and felines (and other pets). 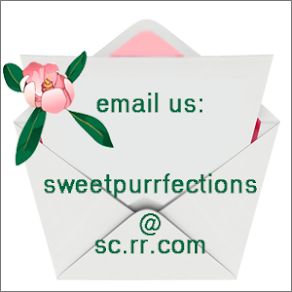 Please visit Preparing for Disaster with Pets from September 2018. 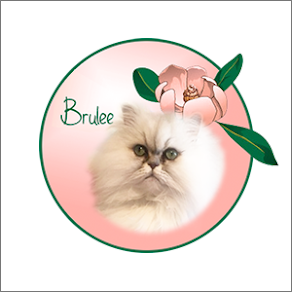 Winners of the Muse Medallion™ will be announced at the 25th anniversary Cat Writers' Association annual meeting this May 16-18, 2019 in St. Louis, Missouri. 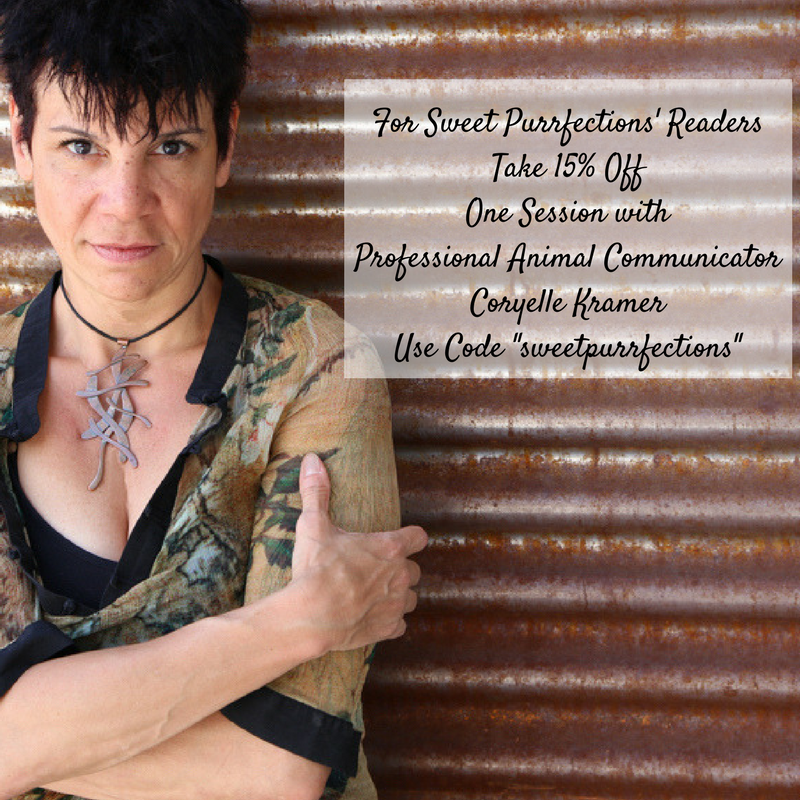 There will be a lot of other very talented writers, artists, and photographers at the conference. In addition, there will be educational sessions (Mom Paula will be a speaker about using Canva and PicMonkey), a book signing, raffles to help support a local shelter, and fun for all who attend. There are only 3 more days to register at the Early Bird Rate. We hope to see many of you there! Big congratulations on your Certificates of Excellence! You definitely earned them! I love when friends I admire and respect so highly are recognized for their accomplishments! Congratulations! Congratulations! I'm so happy for you! Your hard work definitely paid off. Massive congratulations on so many awards!! I know you work hard on your blog and you must be incredibly proud of everything you've achieved and to be recognised for what you do. What an honour! Congratulations on all your certificates. Congrats, we are so very proud of you! Woo hoo!! Congratulations Ms. Paula! You deserve it for all your hard work and dedication to blogging and sharing your life with your girls. Well done!! Congratulations on your well-deserved Certificates of Excellence! We're so proud of you! Congratulations on all your awards! Winning one would be awesome, but to win five is incredible! This is so awesome Congratulations from the bottom of my heart. Totally epic Paula you have worked hard and each certificate is richly deserved!! 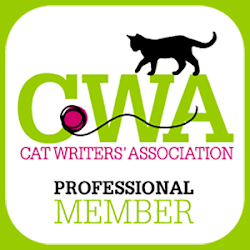 I am sorry I can't be at the CWA Conference to conCATulate you in purrrson!! Congratulations x five! That is wonderful and so very deserving! Frame 'em and proudly display 'em!!! 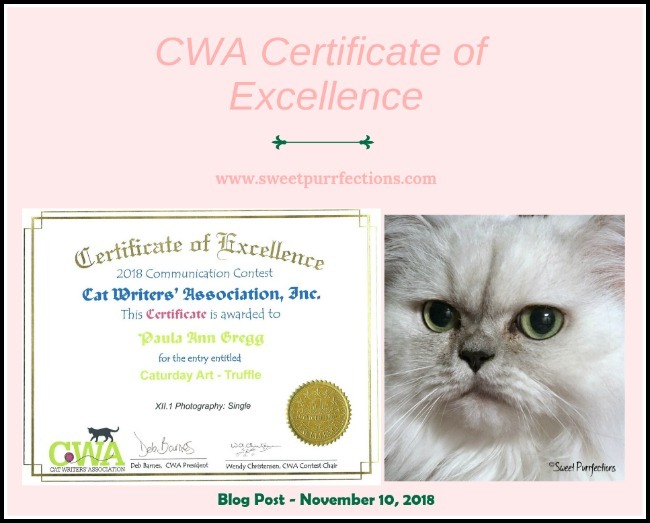 It is so-o fun for me to learn about my dear furr-iends such as yourselves that have been given CWA awards! I can't stop jumping up and down in excitement for you. Purr purr purr. This is so totally epic that your hard work is being rewarded with a couple of certificates of excellence, well done Paula and a huge congrats!